I'm putting my Silhouette through its paces this holiday season. It's perfect for all my crafty die cutting project plans! One thing I love to cut with my Silhouette machine are 3D Paper Flowers. 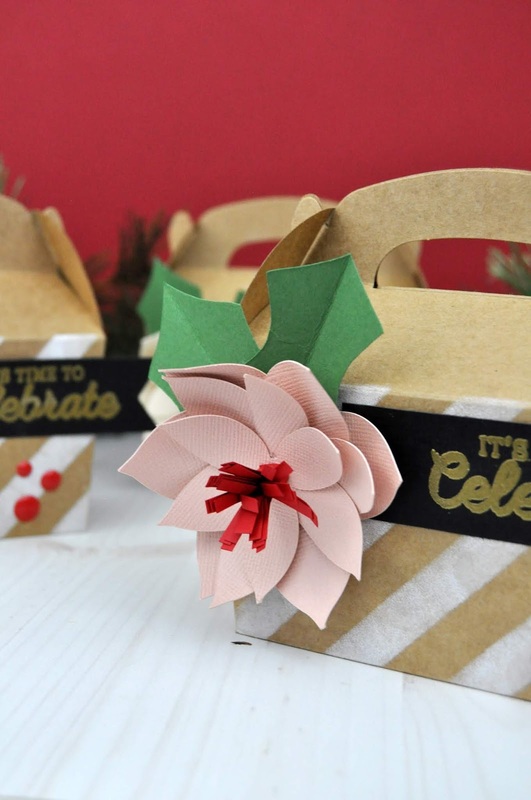 A 3D Paper Poinsettia is the perfect holiday flower to die cut and place on Christmas Gift Boxes. 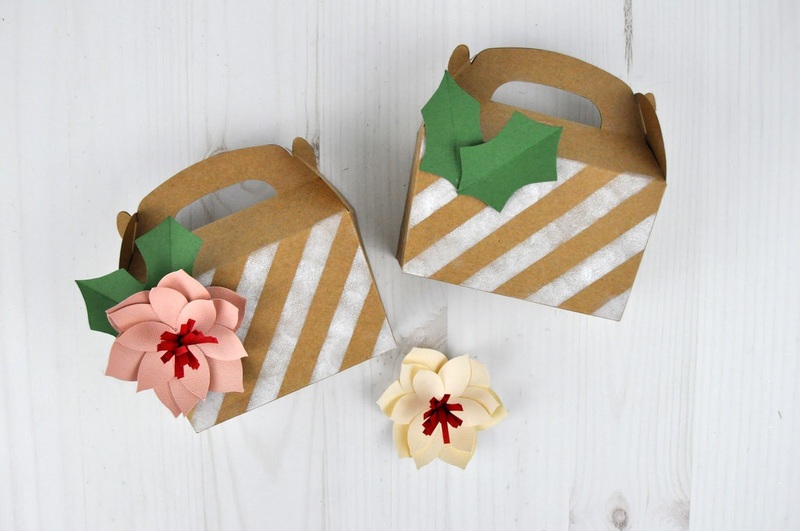 Keep reading for the full tutorial on how to create these charming Christmas Poinsettia Gift Boxes. 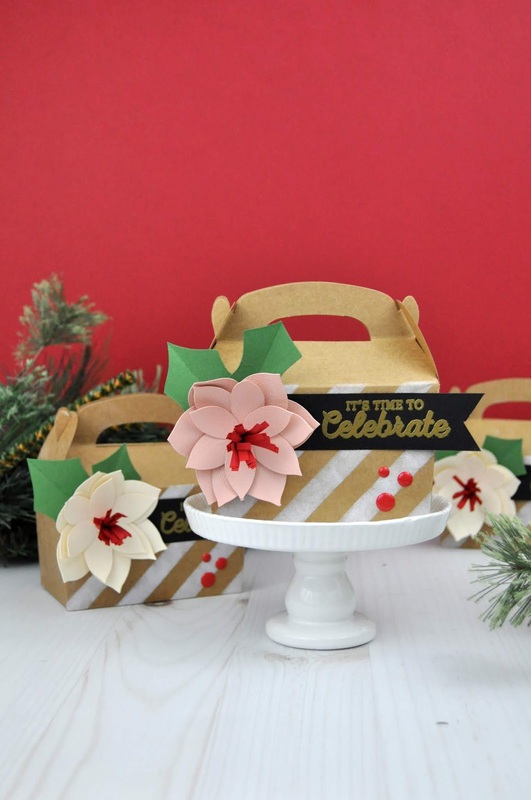 Step 1: Use the Silhouette die cut machine to die cut 3D Poinsettia flowers from blush pink and cream cardstock. 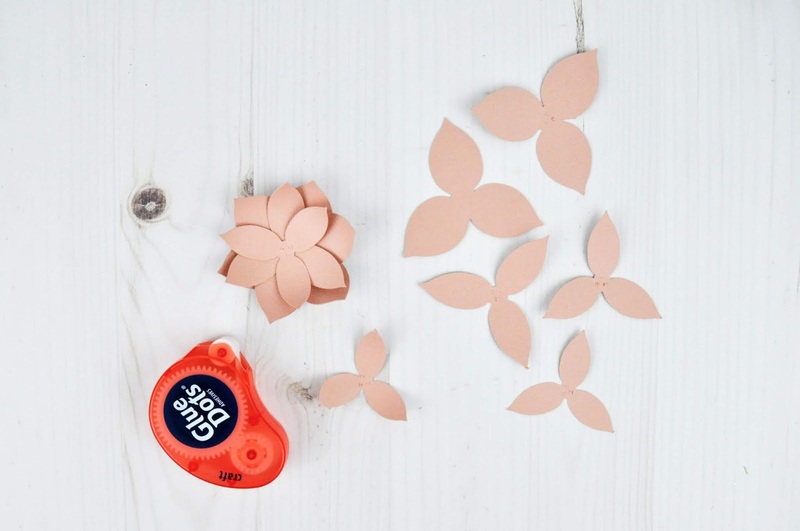 Use a pencil to fold up petals and use glue dots to adhere the petals together. Alternate petal placement on each layer of petals. Step 2: Use fringe scissors to cut 4" of fringe from dark red cardstock. 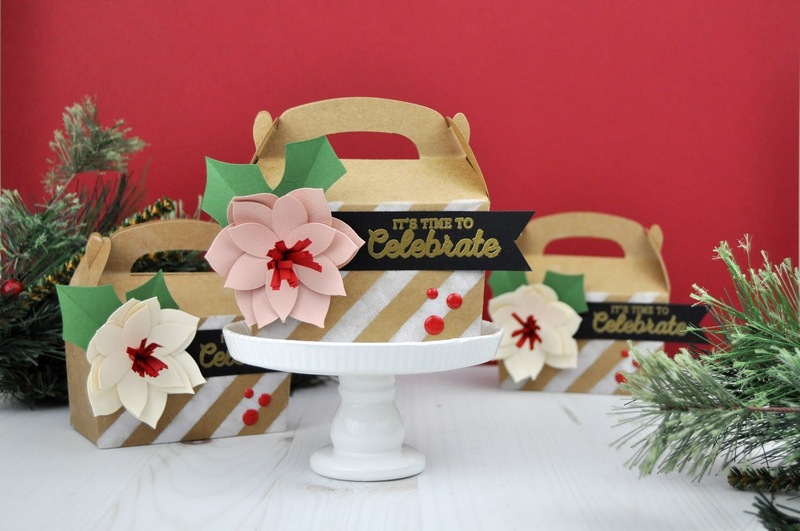 Roll up the fringe and hot glue the fringe to the center of each poinsettia. Step 3: Fold a strip of green cardstock in half. 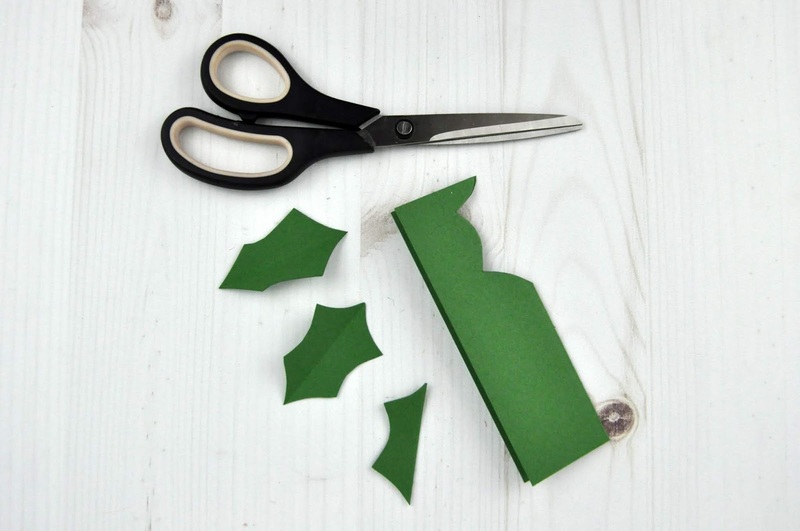 Cut holly leaves from the cardstock. Open for the holly leaves. 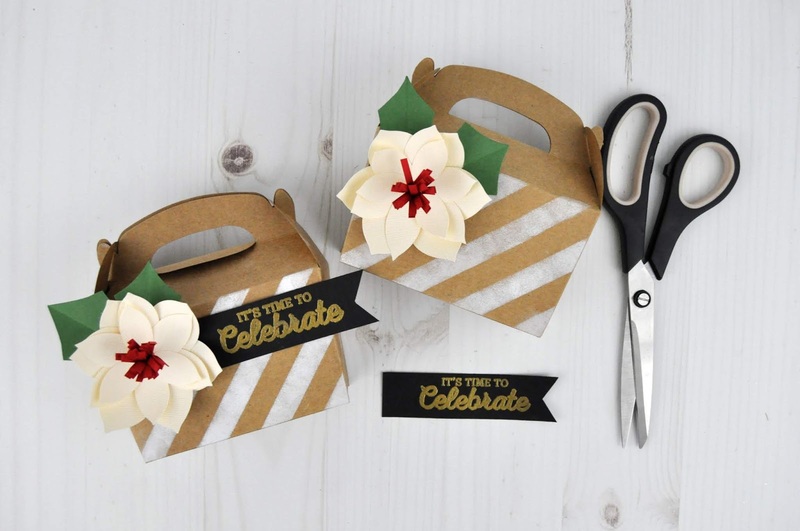 Step 4: Place a diagonal stripe stencil on a small gift box (mine is from JoAnn). 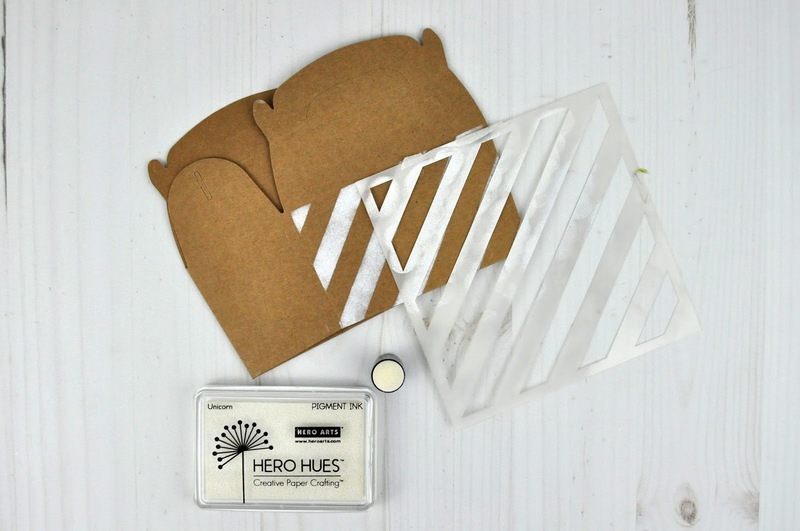 Use a sponge dauber to stencil white stamping ink through the stencil onto the front of the box. Step 5: Hot glue the holly leaves and poinsettia flowers to the front of the assembled (and now dry) boxes). Step 6: Use Versmark ink to stamp a phrase onto black cardstock. 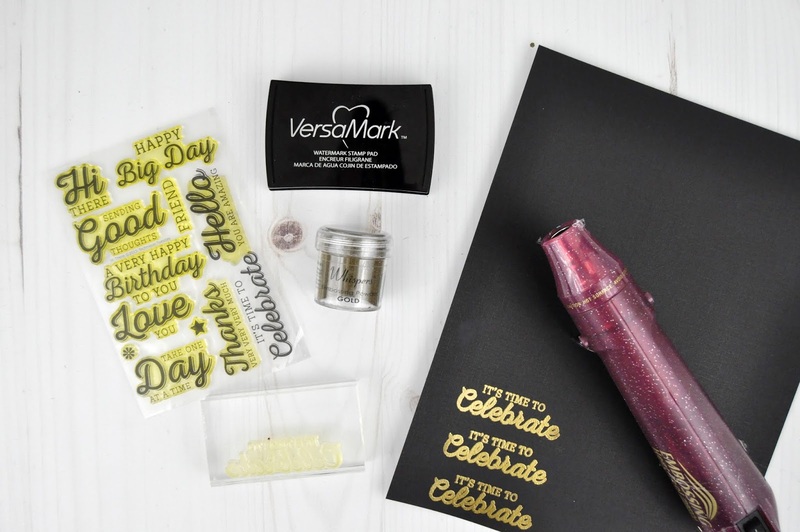 Sprinkle the stamped sentiment with gold embossing powder and set with a heat gun. Step 7: When embossing powder has cooled, cut each phrase into a strip. 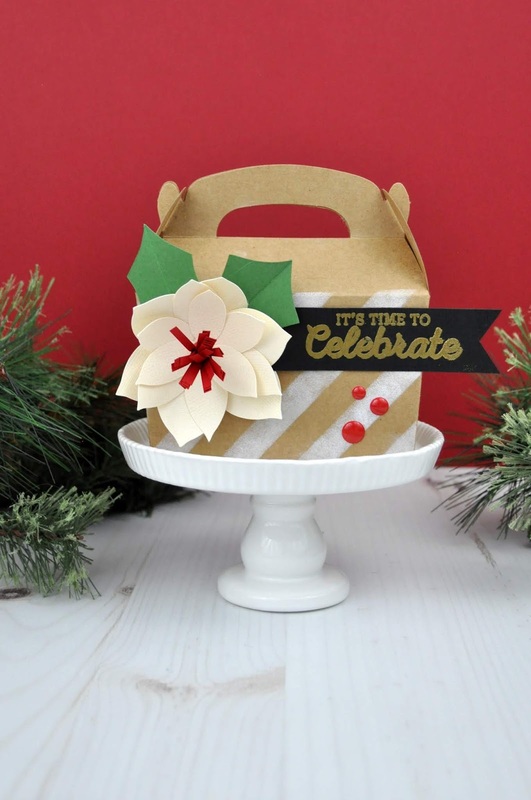 Notch the right end of the stamped strip and hot glue it to the right of each poinsettia flower. 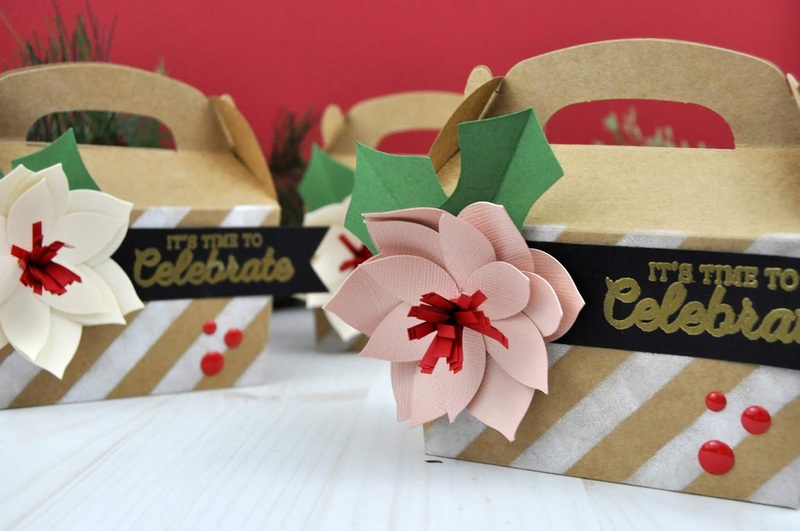 Add enamel dots to the boxes to complete the look. Here's another look at these gift boxes. You can see I've used blush pink and cream cardstock for my flowers. The insides are red. But you could mix this up and do red flowers with white or pink centers. 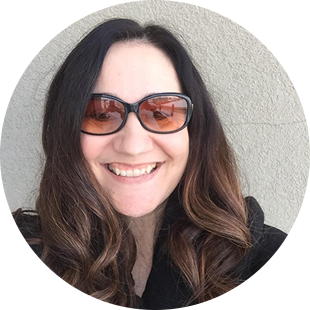 And don't feel like you can't change up a cut file. Add more layers by cutting a few more petals. 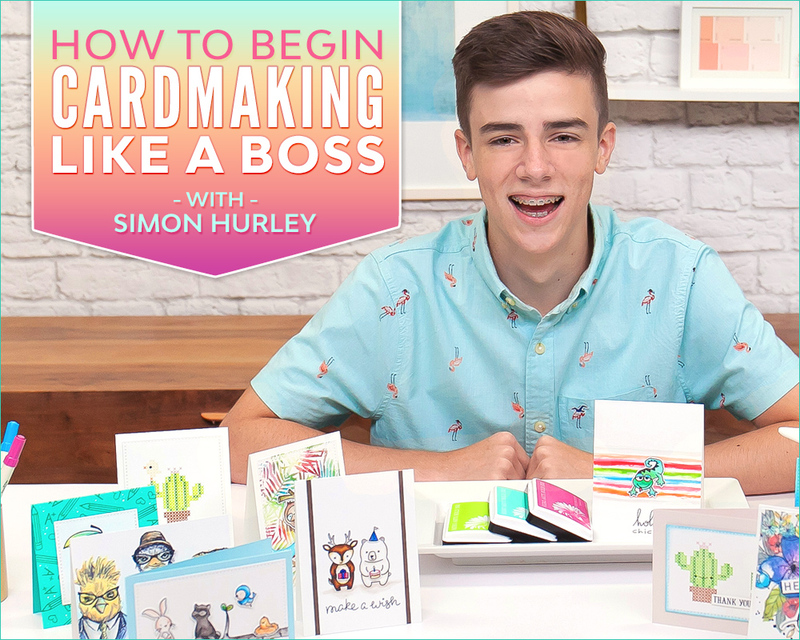 Create your own unique flower centers with brads, buttons, flair badges, paper punches, and more. 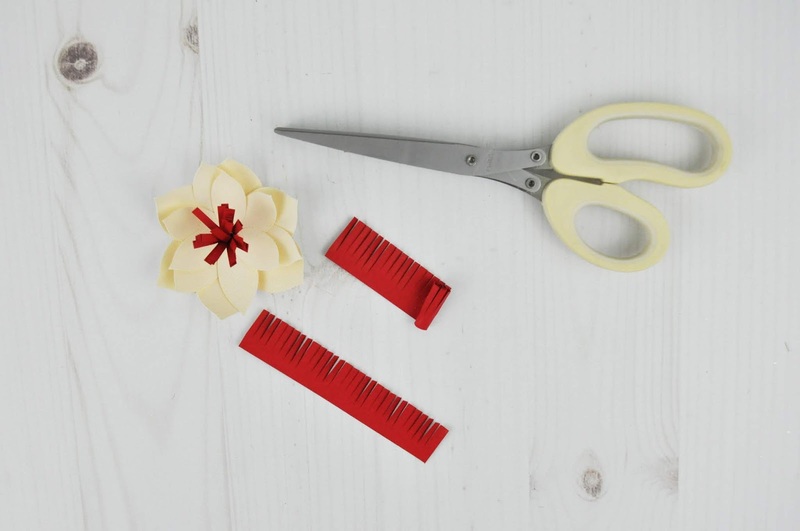 You can also cut the flowers larger or smaller depending upon your project. 3D flower images are a great investment. 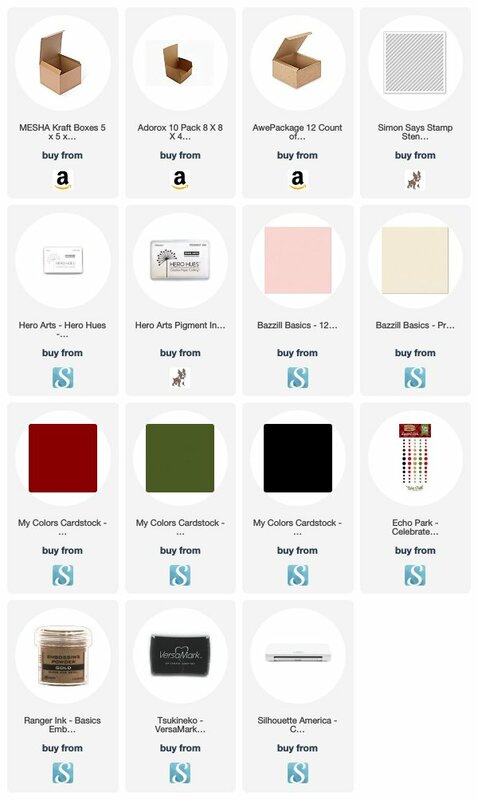 Be sure to pin your favorite images for Christmas crafting later. Oh Jen, these gift boxes are simply amazing!! !